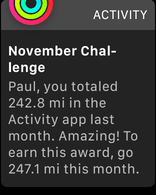 Yesterday, I posted about the buggy behavior of my Apple Watch as it related to a challenge for the month of October. 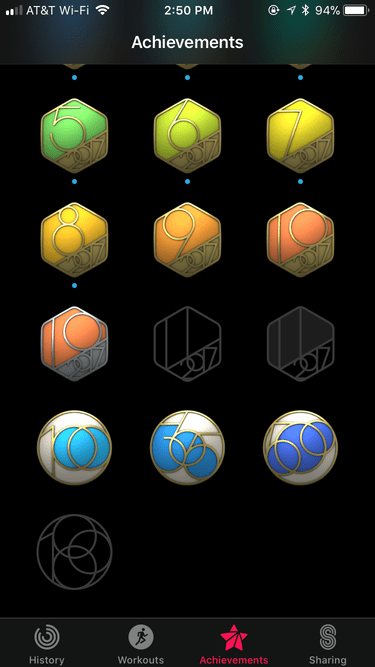 Totals were inexplicably revised down, and as a result I wasn’t awarded the promised badge. Let me clearly acknowledge that I’m dumb for caring about such a thing. However, Apple created this device and wants me to care, so it seems to me that their device should not be so dumb and/or broken. As I was writing yesterday’s piece, I tried a few things to get the badge to fill in. I force-quit and relaunched Activity on both the phone and watch to no avail. I then tried rebooted both devices, but the result was the same. The phone was hung up on its bad math, so I decided to try and move on with my life. 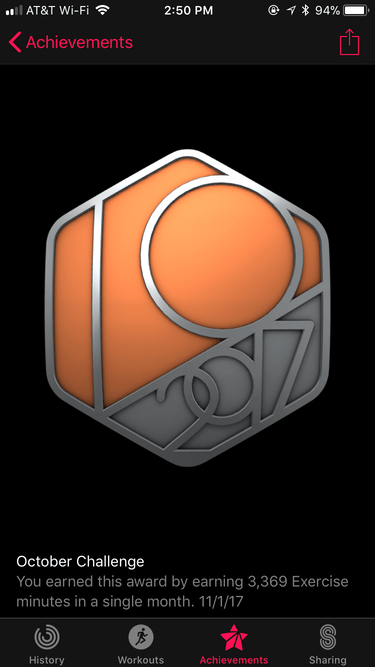 That second orange “10/2017” badge, with silver accents, is the badge for the October Challenge. It had finally been awarded to me. Better still, tapping it showed that my math was correct, and Numbers.app was vindicated. I really did tally 3369 Exercise minutes in October. It sounds much worse as 2 and 1/3 days of exercise. Getting the badge now feels a bit anti-climactic, but I still appreciate it. However, all this prompts me to ask why this happened, why the watch was so slow to properly calculate my total, and why it revised my total downward before later fixing it. That buggy behavior is certainly worth fixing. Addition is extremely fundamental, and it’s worrisome if a device can’t get that right. I was able to manually enter data into a spreadsheet and then sum it, many hours before the watch corrected itself. That’s not how things should work with modern computing devices. After yesterday’s post, I received a handful of emails from readers who shared their own similar experiences. They too saw various totals for the month suddenly dip in frustrating fashion, only to eventually correct themselves. Some hadn’t even updated their devices, and still ran into trouble. There was general agreement that the Watch’s gamification of activity was nice, but failures like these were disheartening at best. I’m no longer certain that the Apple Watch is dumb. Instead, I think it may just be a jerk.